THIS IS NOT YOUR TYPICAL VACATION RENTAL !!! Guests will love this gorgeous 30 plan, end unit at Rancho Las Palmas Country Club where no penny has been spared, no detail overlooked. Traditionally decorated throughout and comfortably furnished this two bedroom, two bath condominium offers two main living spaces, making it perfect for two couples or an entire family. The living room has plenty of furnishings for entertaining family and friends, and a large “smart” TV … so make sure you bring your NetFlix and Hulu passwords! Through the sliding glass door, you’ll step out to yet another living space on the West facing extended patio. 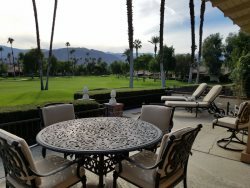 The patio overlooks the North 5th Fairway and has a panoramic view of the San Jacinto Mountains … breathtaking when covered with snow. The patio is beautifully furnished with high-end outdoor seating, more in the fashion of an extended living room. There is a new stainless built-in BBQ that your outdoor chef will love! An awning will help block the afternoon sun on warm days. Please note that sofa and chairs surround a fire pit, and that there is a pub table with seating for two. There are no chaise lounges and BBQ dining may need to be moved inside when entertaining more than two. The kitchen has been completely updated with custom cabinets, granite countertops and stainless appliances … even a gas stove! If you love to cook, this kitchen is perfect for you … with lots of counter and storage space. The dishes, serving ware and cookware are of quality and perfect for preparing anything from a holiday feast to a casual meal. The formal dining area has seating for six. A cozy den with flat screen TV and comfy sofa is a great space for watching TV or curling up with a book. The Queen size sofa/sleeper is the very top of the line by American Leather and will comfortably sleep two. Tucked away at the far end of the den, below a sunny skylight, is small office with two desks … a perfect spot to work on your laptop, keep up with emails or write the next bestselling novel. The master suite has been furnished with a comfortable king bed, luxurious bedding, flat screen TV, ceiling fan and private on-suite bath. The master bath is completely updated with walk-in shower and his and hers vanity. The guest bedroom has also been furnished with a comfortable king bed, luxurious bedding and ceiling fan. The guest bath has also been updated and has a combination tub/shower. Other amenities include Wi-Fi, free U.S. and Canada calling, cable and Roku TV, interior laundry room and fire pit on back patio. This is a no pet, no smoking property. The owner has one vehicle stored in the garage but there is ample room for an additional car inside the two car garage and parking in the driveway.